The ESP LTD MH-103QM solidbody electric guitar is an elegant shred machine that'll set you back minor ducats. You get a comfortable contoured basswood body that fits you like a glove and a gorgeous quilted maple top. You'll enjoy fast fretting on the speedy maple neck and maple fingerboard. A pair of single-coils in the neck and middle positions serve up the chime while the humbucker at the bridge dishes out blistering high-gain tone and a genuine Floyd Rose delivers the vibe. Shred with an amazingly affordable guitar that oozes quality, tone, and playability: ESP's LTD MH-103QM. ESP's MH body style delivers amazing comfort and tone With feedback from their impressive stable of artists, ESP worked tirelessly to get their MH body style just right. The MH Series is all about comfort, tone, and sustain. When you're rocking hard night after night, the last thing you need is an axe that hangs on you like a boat anchor. MH Series guitars fit you like a glove, they're lightweight, and they're nicely balanced, so you don't have to expend energy keeping your neck from diving. Try an ESP MH Series guitar on for size. You won't look back. 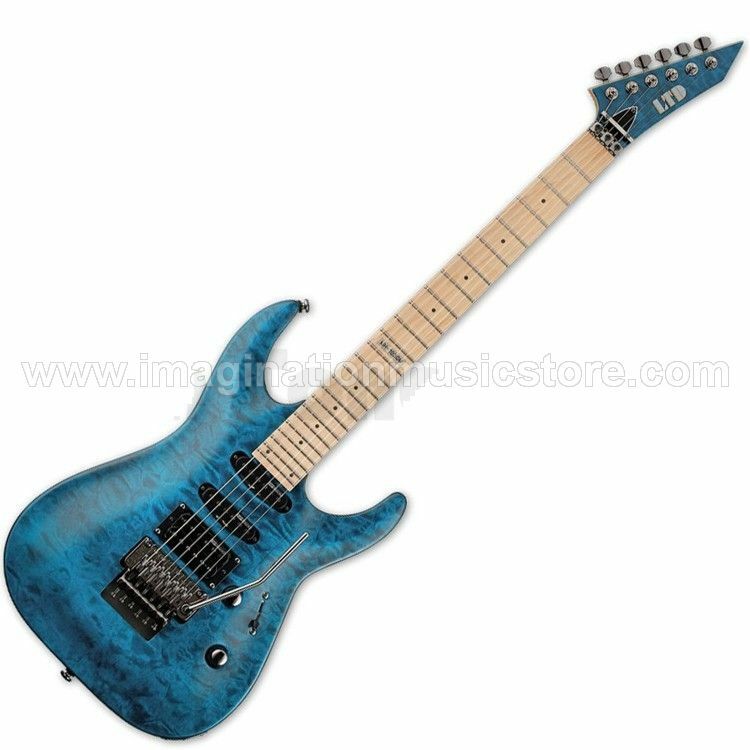 ESP LTD - the perfect guitar for rock or metal ESP LTD guitars were created bring a more affordable version of the classic designs and quality of ESP guitars to a new market. The entire ESP LTD line features premium tonewoods, quality pickups, and solid hardware for a lifetime of use. An exacting eye to detail and quality means that every instrument is ready to rock when it leaves the factory. An impressive list of signature guitars by some of today's biggest guitar heroes shows the popularity and respect held by ESP LTD. If you're looking for the perfect rock or metal guitar, then you need to check out ESP LTD guitars. ESP guitars are built to rock hard ESP started as a manufacturer of after-market guitar parts in Japan in the late '70s. By the mid-'80s, ESP was making custom guitars for some of the biggest names in rock. An exacting eye toward playability and craftsmanship has made ESP Guitars one of the most visible and prevalent guitar brands in rock and metal. Their commitment to quality is second to none, and their impressive roster of endorsers proves it. Including George Lynch, Ron Wood, Gus G., Kirk Hammett, and Brett Garsed, ESP makes the guitars that today's guitar heroes use. Rock like you mean it with the ESP LTD MH-103QM!